Be prepared with enough clothing, good sunglasses and sun block. We recommend you to take a backpack with you. Pack extra clothing, drinking bottle and some snacks with you. Distance of 10 km between service points is long when skiing on open fell landscapes. Weather conditions are demanding and vary from year to year. Good, well-covering sunglasses are needed to protect your eyes from the shining sun and wind, and to prevent snow blindness also when the weather is cloudy. We recommend that every skier has a mobile phone with him or her. The skier has to be at Näkkälä not later than at 13 (Finnish time), at the border not later than 14 (Finnish time) and Sihččajávri crossroad not later than 16 (Norwegian time) to be allowed to finish the race. On Saturday 30.3. is traffic guidance in Hetta start area and in Näkkälä village. Notice! We recommend you to take the bus to the Sihččajávri start area. There is only a small parking space in this area. At 9:00 (Finnish time) 90 km. Start is in Hetta, behind the Sport Hall near Hetta School Centre. At 11:00 (Finnish time) 60 km. Start is in the village of Näkkälä (Enontekiö/Finland). Men and women 30 km. Every skier will have a personal bib from the Race Office. The bib shall be attached and be visible in the front of the skiing jacket during the whole competition. Behind the bib there is a timetaking chip, which is protected with plastic cover. Please be careful with it. Behind the bib there are also the general emergency numbers of Finland and Norway (112 and 113) and the phone numbers oh the first aid. Before starting the race every skier has to write behind the bib her/his own name, name of the closest relative and contact information, possible illnesses and medical allergies. The participation fee includes the transportation of equipment/bags to Kautokeino. Every skier will get in the race office a white plastic bag that is marked with the start number of the skier. Skier can put his/hers equipment to the bag. Remember to take your towel and other personal stuff to Kautokeino for showers. The equipment bag of 90 km skiers will be dropped to the bus near the start area in Hetta. 60 km skiers can leave their equipment to the bus in Näkkälä and 30 km skiers to the bus in Sihččajávri crossroad. You will get back your bag in Kautokeino by showing your bib. The skiers are followed by Red Cross snowmobile team and a a doctor in Finland and by Red Cross snowmobile team in Norway. The general emergency number in Norway is 113 and in Finland 112. If you see that another skier needs help, it is your responsibility to stop to help her/him and call to emergency number or to first aid team. In case of a small injury IN FINLAND, please contact SPR, tel. +358 40 7700 746 . Bigger injuries or sicknesses will always be informed at emergency number 112, only after that to SPR. In case of a small injury IN NORWAY, please contact Norway’s Røde kors + 47 975 41 814 . Bigger injuries or sicknesses will always be informed at emergency number 113, only after that to Norway’s Røde Kors. You can get first aid from every service stop and the service stops will contact Red Cross and rescue department in case of emergency. If you feel that you should give up the race, please report yourself either to Red Cross or at service point. Discontinuation is absolutely forbidden without reporting yourself either for Red Cross or crew at the service stops! We will arrange transportation away from the service stop and to Hetta or Kautokeino. If the skier has not crossed the Finish line before 21 o’clock Finnish time or 20 o’clock Norwegian time, will be qualified for discontiuned. Everyone participates at his/her own risk. The minimum age of the participant of Saami Ski Race Marathon Ski Race (90 km, 60 km, 30 km) is 15 years. The minimum age for participating in the 30 km is 13 years if they ski together with an adult. 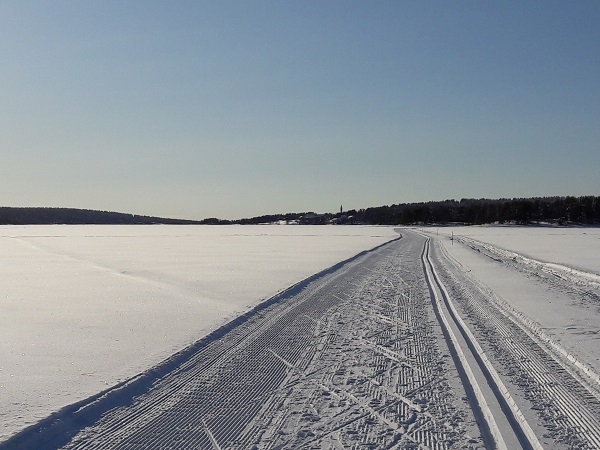 Saami Ski Race skiing trail goes in an open landscape. Be prepared with enough clothing (several layers of clothing, a beanie, gloves…), good sunglasses and sun block. Good, well-covering sunglasses are needed to protect your eyes from the shining sun and wind, and to prevent snow blindness also when the weather is cloudy. The course is marked at even distance by ribbons and flags. There are kilometer posts at every 5 km. Please follow the kilometer posts, so you are aware of your location, in case of possible emergency. This year the course map is not distributed for the skiers, but you can print the map to yourself beforehand from Saami Ski Race webpages. If your ski pole gets broken, there are spare poles on the service stops in Finland. 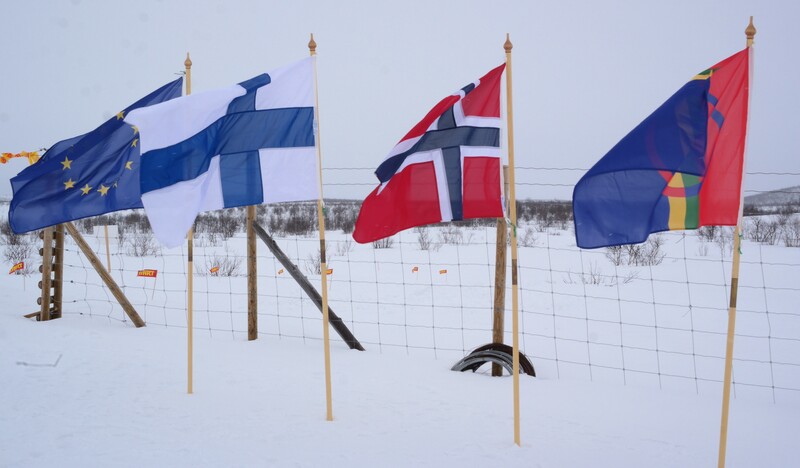 You can borrow a pole and return it in the finish area in Kautokeino. The jury can decide to cancel the whole trail, if the trail or other circumstances are not safe enough. This will be announced at the race office, Saami Ski Race’s webpage and Facebook page. More detailed information about the terms of participation can be found from the Registration page.